El Dealbreakers are an American band that plays party music. Rhythm & Greens, they like to call it. With accordion and bajo quinto (a Mexican 10-string guitar) handling the chords, and a tuba belting the bass lines, the sound is rounded out by fiddle, mandolin, and trumpet. The music is a mixture of blues, country, Tex-Mex, Cajun, reggae, polka-billy, and rock songs done El Dealbreakersâ€™ way. The band will play Pagoda Rocks in Sihanoukville, and The FCC and Paddy Rice in Phnom Penh, among many other dates. Inside one of Phnom Penh’s trendier nightspots, the Chinese-style red string curtains and soft amber lighting contrive for an atmosphere of opium den chic, yet the ambience is anything but sublime. Unapologetically red, the waitresses all wear identical outfits — mid-length red skirts and matching blouses with low black pumps — and a coterie of male supervisors keeps watch over the girls, the customers and the money. For an uptown Phnom Penh nightclub, the place feels more like a downtown Shanghai brothel. Sitting quietly in the king chair at the head of the table in one of the club’s semi-private VIP rooms, Filipino deejay Rocky Aujero seems far too hip for his imported surroundings. Known widely across the hip-hop world as DJ Rocky Rock, the 29-year-old California boy is the official deejay for three-time platinum-selling artists the Black Eyed Peas. Rock, as his friends call him, is in town for a Saturday night performance at Club Fever, and on Friday, he and his crew are out promoting the show. For decades an unheralded Asian capital, Phnom Penh has long been ignored by international acts touring the region, but over the last year or so, the city has wooed a number of A-list names. Sean Kingston played in February 2009, and hip-hop megastar DJ Cash Money rocked the capital in September. New York electronic duo Ratatat and Australian indie-pop sensation I Heart Hiroshima capped the year with shows in December. The DJ Rocky Rock show keeps last year’s high-wattage star-power flowing smoothly into the new decade. 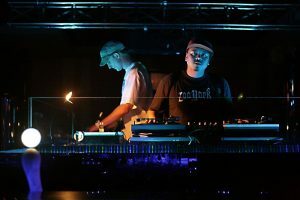 Yet as many international acts have discovered, first-world fame doesn’t always travel well, especially in Phnom Penh’s nascent club scene, where local crowds live far beyond the influence of countries where hip-hop is king. Rocky says he is bringing the latest music from the American West Coast scene, but Phnom Penh club crowds are notoriously fickle, and deejays have long lamented the fact that Western hip often translates to Cambodian flop. 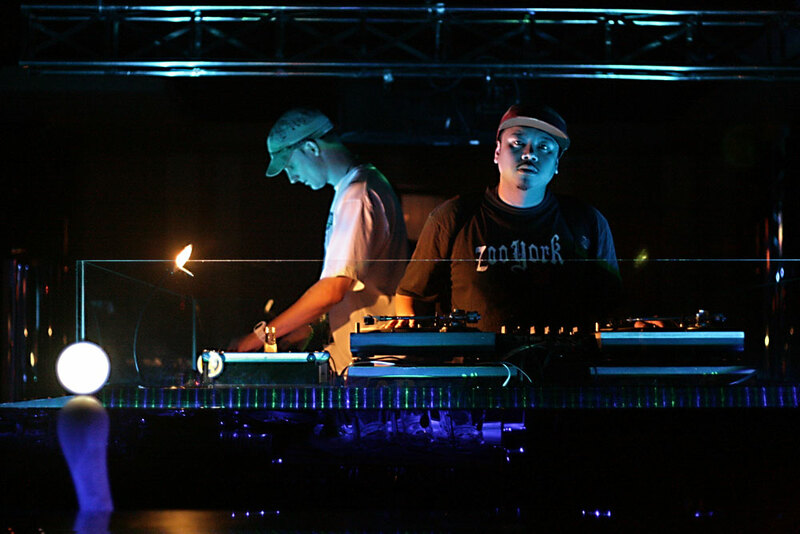 Benjamin Walters, a resident DJ at the Qbar in Bangkok who performs under the name Tech 12, flew in with Rocky from Thailand. 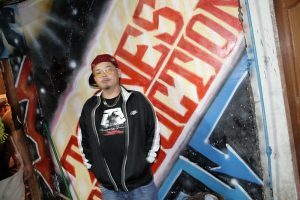 In years of working the region, including dozens of shows in Phnom Penh, Walters has seen many a self-important deejay chase away the crowds with big beats and bad eyesight. Back in Los Angeles, Rocky deejays most Friday nights at the Pig N Whistle in Hollywood, where he opens for DJ Muggs from Cypress Hill. The crowds line up every week to hear his music. But in Cambodia? Despite the chaos around him, Rocky never slipped, and the years of dedication paid off when in 2001 he placed first at the Guitar Center USA DJ Championships, a nationwide event including thousands of deejays. More victories followed, and in 2002 and 2003 Rocky made it all the way to the USA country finals of the DMC, what is most fittingly described as the deejay World Cup. Then in 2004 things really exploded. Already a well-known player on the West Coast hip-hop scene, Rocky hooked up with apl.de.ap from the Black Eyed Peas, who is also of Filipino heritage, and together the two planned their Filipino caper: a Manila concert for the Black Eyed Peas with DJ Rocky Rock as the opening act. As expected, the show was a great success, giving Rocky huge exposure to the Filipino fan base. With the momentum of the concert behind him, Rocky entered the 2004 DMC from the Philippines, where he won the country title and went on to place fifth in the world. From the Manila concert his friendship with apl.de.ap also blossomed, and when the Black Eyed Peas hit the studio to record “Monkey Business” a few months later, they asked Rocky to lay down his scratches and work the turntables. He’s been the Black Eyed Peas’ official deejay ever since. Rocky released his first album, titled “Digital Fingers,” December 15, with an official launch party held three days later at the Pig N Whistle. For the veteran West Coast deejay, Fingers represents a return to his old-school hip-hop roots, and the album largely serves as a showcase for Rocky’s immense scratching skills. The CD art portrays Rocky poised on top of the globe, and while it’s an apt metaphor, he is anything but complacent. As Rocky sees it, the album is not so much a capstone to his career, but rather a foundation on which to build even bigger successes. Rocky produced all nine songs on Fingers, and in the days ahead of his Club Fever date, he has been rehearsing the vocals of “Looking at You,” a new song that he plans to debut at the Phnom Penh show. At exactly midnight, DJ Rocky Rock steps into the deejay booth at Club Fever and turns on the blue glow-lights that line the sleeves of his red zip-up. Tech 12 opened with a fast-paced hour-long set, and the crowd is anxious to keep dancing. Rocky enjoys the roar of the room for a few seconds then shouts into the microphone. Rocky bounces to the tempo of the music for several moments, and then thrusts his hand into the air too. From there Rocky takes the crowd on a “mood rollercoaster,” making all the stops required of a proper West Coast hip-hop ride, from L.A to Long Beach, Compton to South Gate. Forty-five minutes into the set when Rocky plays “Looking at You,” the crowd roars its approval and keeps dancing. Drenched in sweat after a few songs, Rocky cuts the glow lights and, without missing a beat, sheds his red zip-up. Underneath he is wearing an oversized yellow t-shirt with an abstract design and big bold letters across the top. And tonight he is, but it’s the nascent Phnom Penh hip-hop scene that gets to wear the crown.